It is said that memory works by strengthening neural pathways. So it seems logical and proven by experiments and anecdotes, that exposing yourself to the same experience more than once is the best way to learn. It is also a hard thing to do, as we all know, because we tend to get bored when re-experiencing something that is still fresh in our memories. This is where discipline shows its value. Discipline enables us to do something, despite any negative emotions, because we know that we will benefit from it in the long run. I’m sure there are biological and evolutionary reasons why memory works as it works, and why we humans have the power to forget things. I suppose it has everything to do with being prepared and having working knowledge that is of actual use in our daily lives, and a passive knowledge of things that are less urgent. As you may have experienced, this passive knowledge is pliable, and seems to depend on our emotional state and being. If you’re (an) angry (person) you remember things differently than if you’re (a) happy (person). This can’t be helped. We humans are evolved to survive and use our knowledge to our own advantage, even if that means to tell ourselves a little white lie in the heat of the moment. Individuals that didn’t, couldn’t produce any offspring –or at least, not enough offspring– to survive into the present day. We are the product of those who came before us, in the most literal sense. 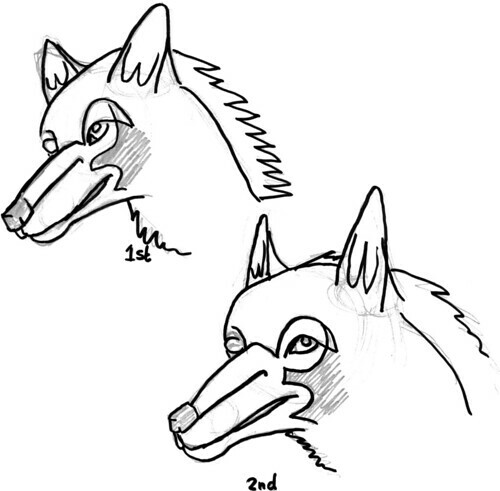 So I drew two similar poses of the same canine head, based on an illustration in “Drawing Wildlife” by J.C. Amberlyn. The idea is not to copy the illustration, but to try to understand how it works. If I’ve done that, I hope I’ll be able to draw similar poses from other angles. It therefore doesn’t really matter that both versions (1st and 2nd) aren’t carbon copies of each other. What matters is that I have done the same process twice, and am starting to understand what the author meant by the subtle hints that are given in the illustration. If it were even possible, those subtle visual hints would probably require an extra book of content to explain in words. Amberlyn stresses this in the foreword, by stating that this book is not for beginning artists. I’ve seen other pen drawings of dog like creatures (wolves) that were less instructional than those of Amberlyn. I guess those other illustrations were more to impress, while those in this art instruction book were clearly meant to teach. Unfortunately, many so-called “art instructional books” are more to impress the copy owner. It is as if the authors of such books challenges us and our abilities to draw. Books without this competitive attitude tend to have a higher educational value, while those other books are meant to inspire. Both offer value to someone who wants to be an artist, but it is often hard to distinguish purely from the title and cover. You have to browse through to see what kind of book it is. And of course, many (art instructional) books are never used. They are just there to impress either the owner (“One day I will teach myself to draw really well”), or their friends and occasional visitor (“As you can see, I have many books in my library”). My stance on it is that books are meant to be read, not to be admired. Books that are never read are a waste of precious shelf space, in my opinion at least. I think that if you’re good at drawing, you’re good at putting individual forms onto paper and combine them into something that expresses your vision of a subject. It is both the shaping of individual forms and the combination of those forms into an image which throws many people off, especially if you take notice of what you’re doing, because of outside pressure (not wanting to fail). The psychology of the draftsperson, the integration of the parts and the parts themselves define your drawing. If you’re serious about your art –which I am– you will try to tackle all three areas. 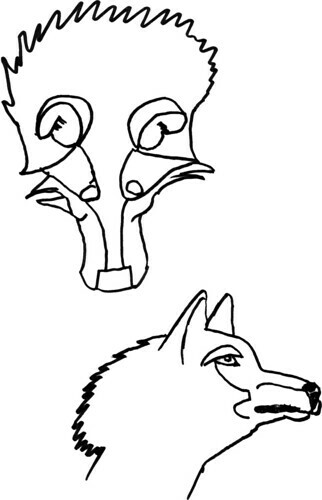 In the above drawing I’m trying to learn how a particular image, that of the wolf, is constructed. I use a book as my guide, which is perhaps not the best guide, but it is always available. A human teacher would probably be much better, and I have tried to find him or her, but in my local town there seem to be no illustrators who offer their services as an instructor. More than enough art instructors willing to be paid to teach you self-expression, though. Art does not equal illustration, which isn’t art for art’s sake, but visual art as a part of a larger whole, serving a specific purpose instead of just being there. It is this purpose driven art that art instructors don’t seem to grasp. Ah well, I muddle on, with my art instructional books, in the hope something of the ideas of the author stick in this thick gooey mass that inhabits my skull. Learning is hard work and requires time and attention of the one who is doing the learning. Or perhaps I’m just being stubborn.